Windows 8.1 also installs the worst privacy-busting feature Windows has ever seen, and it nukes several key Windows 7 features in its headlong pursuit of SkyDrive profits. The best improvements for desktop users dismantle Windows 8's pushy ways -- a fact that speaks volumes. The best improvements for developers sweep away some infantile restrictions. And the only reasonable way to use the old-fashioned desktop still requires a third-party Start menu utility. This review covers Windows 8.1 as we see it right now -- with the official bits available, as of yesterday, on TechNet and MSDN. You can bet your bottom dollar that the Microsoft devs are working overtime to zap a few outstanding bugs (I've hit a few) and to spiff up the still-laggardly Metro apps. What will happen between now and General Availability on Oct. 18 is anybody's guess, but it's likely that several of the Microsoft-written Metro apps will sprout much-needed features. We'll review the new Microsoft-originated Metro apps as they become available. 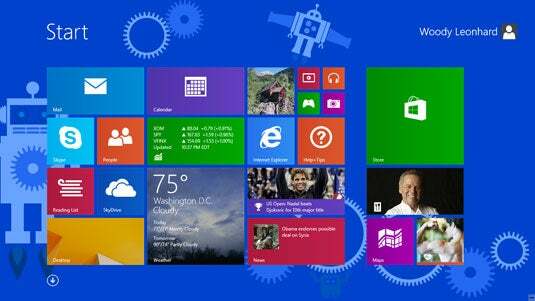 Think of Windows 8.1 as a few steps forward and a few steps back. In the forward direction we have a little more flexibility in Metro with live tiles, more "discoverability" for inscrutable settings and actions, and a Metro Photos app that largely eliminates the need for a free photo editing package. Yowza. On the old-fashioned desktop, we have the ersatz Start button that merely dumps you back into Metro, the ability to boot to the desktop, and a way to disable all the infuriating and intrusive hot corners inherited from Metro. Experienced Windows users who like to run on the Metro side -- all 10 of you -- will also appreciate the migration of settings and options from the legacy Control Panel over to the full-screen Metro PC Settings window. Alas, that migration is not yet complete. In the backward direction, we have lamentable changes related to Smart Search, Libraries, and SkyDrive. Smart Search is plenty smart for Microsoft and its advertising ambitions, but for Windows customers, it's the worst privacy intrusion in the history of Windows. Libraries, introduced in Windows 7 and extended in Windows 8, have been decapitated -- although several Microsoft apps use them. I guess somebody on the Metro apps team didn't get the memo. And SkyDrive? Baking SkyDrive into Windows is long overdue, but the intrusive way it's implemented by default makes SkyDrive work more like a straitjacket and less like an option. Figure 1: Windows 8.1 adds new live tile sizes and a down-arrow to the All Apps list. Hover your mouse in the lower-left corner, or tap, and you see a down arrow that leads to the All Apps list (shown in Figure 2). The All Apps list is an unwieldy collection of "dead" tiles, organized in a way that mimics the way Windows 7 puts programs in the Start menu. If you install a legacy Windows 7 desktop program in Windows 8.1, this is where its tile appears. The All Apps collection is strictly two-dimensional -- there are no cascading groups -- so the tiles keep going and going. Figure 2: The All Apps list, loosely organized like the Windows 7 Start Menu, remains stalwartly and sprawlingly two-dimensional. Microsoft ships some new colors and wallpaper for use on the Metro Start screen, as well as the ability to run a slideshow on your Lock screen (based on pictures in a local folder of your choosing, or on SkyDrive). Note that the wallpaper customization happens on the Metro Start screen's Settings > Personalize menu, while Start screen customization sits in the Settings > Metro PC Settings > PC and Settings > Lock screen section -- no idea why. With the right setting in Metro PC Settings, you can also get to the computer's camera from the Lock screen without any intervening steps. Metro Snap no longer confines the snapped pane to a fixed 320-pixel stripe. You can now adjust the width of each snapped pane individually, although the panes tend to disappear when they get too narrow. Instead of limiting the number of panes to two, you can fit as many panes on the display as you like, with the maximum number of panes calculated by dividing the horizontal resolution of the screen by 500. Thus, a 1,920-pixel-wide screen can hold three panes. Metro Snap still doesn't have the overlapping/stacking window capability we've known since, oh, Windows 2.0. The Metro PC Settings app has bulked up considerably. For example, you can actually add a new user to your PC while staying on the Metro side. But Metro PC Settings still lacks the ability to make the new user an administrator. The Charms bar has the same old Charms, with a few new tricks. For example, the Devices charm now includes options to Play, Print, and Project (on a projector). Unfortunately, if you click on the Play icon, you invariably get the notice that you can only Play from apps. And when you're in a Metro app that should be able to Play, you may find that the app isn't smart enough to connect to the Charm and will use its own Play button. The Charms themselves do almost nothing on the old-fashioned desktop. For example, choosing Devices > Print while in legacy Word doesn't do a thing. I still get ill every time I read reviews about the Windows 8.1 ersatz Start button. "It's back where it belongs on the left side of the taskbar!" Well, yes, there's a Start button on the left side of the taskbar, but it doesn't do anything other than swing you back to the Metro Start screen -- just as you can click in the lower-left corner of the current Windows 8 desktop and get rocketed back to the future. The only difference is the icon. That said, there are some improvements on the desktop side of the fence -- and they have more to do with getting Metro to back off than any long-sought old-fashioned features. All the significant improvements to the desktop appear in a solitary dialog box, shown in Figure 3. Figure 3. The only Windows 8.1 improvements to the desktop appear in this hard-to-find screen. Turn off the annoying behavior where, if you hover in the upper-right corner of the screen (you know, where the "X" icon is on any full screen window), Windows 8 decides you want to see the Charms. Pro tip: Use Win-C if you absolutely must see the Charms. Turn off the annoying behavior where, if you hover in the upper-right corner of the screen (say, near Word's File menu), you suddenly see currently running programs. Pro tip: Use Alt-Tab, the "Coolswitch" that's worked for more than a decade. For PowerShell junkies only; see the next section. Apps View (see Figure 2) isn't anything at all like the Windows Start menu, but it's the closest substitute available. I let Windows 8.1 search everywhere and have it show the desktop apps first. The Win-X menu -- the one that appears when you right-click on the new Start button, either on the desktop or on the Metro Start screen -- now has the ability to log off, shut down, or restart the machine. I have no idea why Microsoft makes you choose between the Windows PowerShell and the Command Prompt entries on the Win-X menu (see Figure 3). I guess the programmers ran out of time. They only had a year. Searching through the Search Charm used to be completely unpredictable. Some Metro apps supported it, all desktop apps ignored it, and when you ran a search through the Search charm, you had no idea what you'd get back. In Windows 8.1, most apps now have their own Search functions. Skype is now baked in to Windows 8.1, replacing the tired, old Messenger app that's been hanging around Windows like a sick dog since the supremacy of MSN last century. While the Metro Skype app doesn't have anywhere near the functionality of Internet-based Skype, it isn't bad. It's one of the few Metro apps I use from time to time. If you sign on to Windows with a Microsoft account, SkyDrive comes along for the ride. In many situations, as long as your needs are simple, SkyDrive is a reasonable alternative to Dropbox, Box, Mega, Mozy, Google Drive, Amazon Cloud, SpiderOak, SugarSync, and a dozen others -- all of which have good and bad points. What I don't like is the way SkyDrive now locks into your system. Two months ago, I complained long and hard about a new Windows 8.1 "feature" called Smart Search. Microsoft didn't listen to me. This RTM version of Windows 8.1 continues to turn on Smart Search by default. Microsoft uses Smart Search as an excuse to track your local searches -- searches you make on your computer or your network -- and gathers your local search terms to sell you things. It's the ultimate desktop Scroogle. Bing Ads will be an integral part of the new Windows 8.1 Smart Search experience. Now, with a single campaign setup, advertisers can connect with consumers across Bing, Yahoo, and the new Windows Search with highly relevant ads for their search queries. In addition, Bing Ads will include Web previews of websites and the latest features like site links, location, and call extensions, making it easier for consumers to complete tasks and for advertisers to drive qualified leads. To turn off Smart Search, from the Settings Charm, choose Change PC Settings, then Search and Apps, and Search, and move the "Get search suggestions and Web results from Bing" slider to Off. Perhaps sanity will prevail and Smart Search will be turned off by the time Windows 8.1 hits General Availability. In another slap at experienced Windows users, Windows 8.1 starts to dismantle Libraries. Where Windows 7 and Windows 8 both ship with fully functional Libraries (the Documents Library, for example, contains the \<user>\Documents folder and the \Public\Documents folder), the Documents Library in Windows 8.1 only contains \<user>\Documents. The Music, Pictures, and Videos Libraries don't get the Public folders, either. If you sign on with a Microsoft account, Windows 8.1 activates SkyDrive, the SkyDrive folder gets added to the Documents Library, and it's pegged as the default folder in the Library. Thus, if you save a new file in Word, WordPad, or any other word processor that wants to save to the Documents Library, your new file will go into SkyDrive -- where you get to pay for the privilege if you use enough space. To make matters worse, where Libraries figured prominently in Windows 7's Windows Explorer and Windows 8's File Explorer, in Windows 8.1 they're hidden. You have to go through the View tab in Explorer to bring them back. And heaven help you if you need to explain to a novice how to find their Public folders. In Windows 8.1, the treatment of Libraries is all over the place. You can't see them in Windows Explorer unless you find the right switch. But if you go into the Microsoft-made Metro Photos app, you work directly with the Photos Library. The Xbox Metro Music and Metro Video apps use the respective Music and Videos folders, not Libraries -- and it's very difficult to bring in Music and Videos from the Public folders. Windows Media Player works with the Music Library. One word of warning: If you use a Microsoft account in Windows 8.1 that was also used in Windows 8, you'll see your old Libraries in full force. Running your Microsoft account on Windows 8.1 won't dismantle your Libraries; Windows 8.1 just won't build new Libraries for new Microsoft accounts.